The Lost Expedition is a game by Peer Sylvester, published by Osprey Games. It is for 1-5 players. In this game, players will be leading a team of three explorers through the jungle to find the lost city of El Dorado. 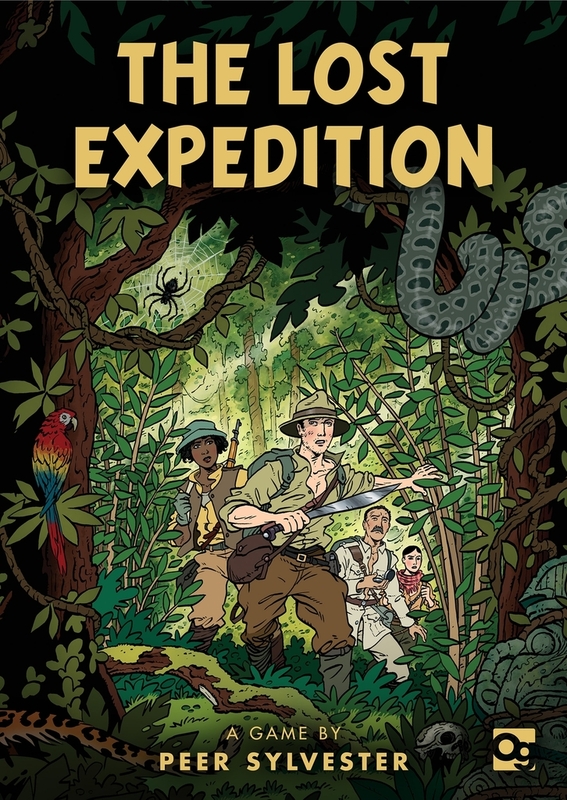 They will be following the path of renowned explorer Percy Fawcett as they try to survive the hazards and events that befall them on their adventure. They’ll need to use every bit of expertise they have to ration their resources and reach their goal. In the end, if the players are able to reach the lost city of Z, they will be declared the winners. Before I get into the actual setup of the game, it should be noted that this game can be played in 3 different ways: solo, cooperative and head to head. In this review I will mainly be explaining the cooperative rules. However I will touch on both of the others in the gameplay section below. To begin, one explorer of each Expertise should be placed on the table to form the team area. There should also be 3 Ammunition and 4 Food tokens placed in the team area. The remaining Ammunition and Food should be placed in separate supplies. The Adventure cards should be shuffled together and each player dealt 4 cards each. The deck should then be placed face down on the table. When playing with only 2 players, 6 cards are dealt instead. Players should decide on a difficulty level. For normal difficulty, 9 Expedition cards are then placed in a row in the middle of the play area. The lost city should be the last card. A pawn is then placed on the first expedition card at the opposite end of the lost city. The Morning/Evening token is placed on Morning and placed near the play area. The first player is chosen and is given the Expedition Leader token. Play now begins. The game is played over a series of rounds. Each round represents a day of the expedition. Each round consists of 2 phases or hikes; Morning and Evening. The first phase or hike is the Morning hike. In this hike, the players in turn order will each place one card from their hand to the table in a single row. Once they have each placed one, they will then place a second one, again in turn order. Once each player has placed 2 cards, the played cards are then arranged in numerical order from lowest to highest. Players will then resolve each card one at a time in order from left to right. Cards will cause the players to either gain or lose resources or expertise by responding to the symbols in the boxes. Some boxes on the cards must be triggered, some only 1 box must be triggered and some are completely optional. Once the card is resolved, it’s discarded unless the player gains it due to an Expertise symbol. After all the cards have been resolved, the Morning token is flipped over to the Evening side. The team will now lose a food as the Explorers are forced to eat. The second hike is the Evening hike. Players now follow the same routine as before by playing 2 cards from their hand one at a time. However, this time the cards remain in the order that they are played. Every time a card is played, it’s added to the right of the previously placed card. They will not be rearranged like they are during the Morning phase. Once again, the cards are resolved just like during the Morning hike. Once all the cards have been resolved, the Evening token is flipped back over to the Morning side. The team now loses an additional food to feed the Explorers. Once the round is over, the Expedition Leader token is passed to the next player in turn order. Players will then draw 4 cards from the Adventure deck. If the deck is empty, the players will lose a food from the team supply. The discard pile is then shuffled to create a new deck. It should be noted that during the game if the team needs to spend a food and there are none remaining in the team supply, one of the Explorers must lose a health. If the team is forced to spend Expertise, they can either discard a card from their team area with the matching symbol, lose a health from an Explorer with the matching Expertise symbol or lose 2 health from an Explorer without the matching Expertise symbol. The game continues until 1 of 3 different things happens. If the pawn makes it to the lost city of Z card, the players win. If all 3 of the explorers die, the game ends and the players lose. If the Adventure deck runs out for a second time, the players lose. This is a great looking game. First off there is a huge stack of tarot sized cards. There are cards for the 6 different explorers, including one that looks amazingly like Teddy Roosevelt. There are cards for the Expedition to the lost city of Z. There are cards that shape the adventure. This of course is the largest pile of cards and is where the actual game play comes in at. Each card has some amazingly looking comic book style artwork that I simply love. 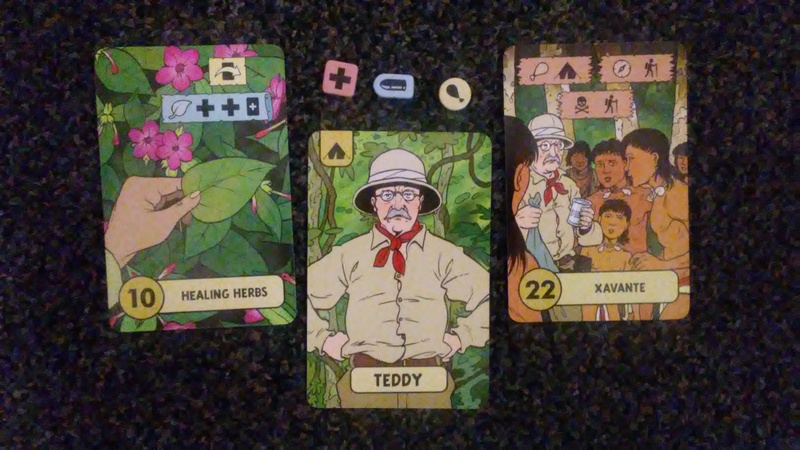 I like how that each card gives a real feel of the actual story that you’re kind of writing as you play the game. The cards have a very glossy finish making it a bit hard to shuffle. I kind of wish they had been linen finished or something of that nature to make things a bit easier and to keep them from sticking together. There’s also several cardboard tokens. There are tokens for health, food and ammunition, as well as for the Expedition Leader and the Morning/Evening. These are a little bland looking but they match up with the icons on the cards without being overly distracting. With that in mind, I think it makes sense and is completely understandable. The game also comes with 2 wooden meeples and a couple of player aid cards. The meeples are brightly colored and look great. The player aids are very helpful when playing the game and are great to have. For me, I like how well everything comes together and looks when it’s laid out on the table. Overall, I love the look and feel. I just wish the execution had been a bit better. The rulebook for this game is well designed. I like that the book has a page for the Designer’s notes where he explains his inspiration and notes on how the game came about. The book has lots of great pictures and examples throughout. Everything about the game, cards, and icons are explained in great detail, as well as the different phases of gameplay. As I mentioned at the beginning of this review, the book has 3 different sets of rules which I’ll cover in just a bit. There’s a page for clarifying a few different items and a page about the explorers in the game. The back cover is yet another player aid with rules to remember and explanations for the different icons on the cards. Overall, the book does a really good job of covering everything in an easy to read and easy to understand way. I like the look and feel of it and think that the designer did an excellent job with it. I’m very pleased with the book. This is an amazingly fun game to play. I really like the sense of adventure and excitement you feel as you work your way through the jungle to the lost city. Every card can spell your doom or can provide you with the resources you need to be able to keep going. I like how that there are so many choices to be made. Sometimes your choosing the lesser of 2 or even 3 evils, while other times it’s all about making the best choice of what you’ll gain. Basically as you play the game you’re trying to best use the resources that you have at hand and survive the different obstacles and hazards along the way. All while trying to move your pawn forward on the path. It’s not a difficult concept to grasp. What is difficult is just how challenging this game is. It can be quite tough, even on the easier difficulty setting. I like how that the story kind of comes out as you play the game and each time you play the story changes. This one reminds me of those Indiana Jones movies and makes me want to play it more and more. I mentioned earlier that there are several different sets of rules for how the game can be played. I’ve already discussed the cooperative rules. The solo rules are much like the co-op rules except that instead of another player adding cards to the line, you’re drawing them from the deck to add them. During the Evening hike you have to choose when to draw cards and when to play cards from your hand. Other than that, the rules are pretty much the same. Head to Head is even more different. In this version the players add cards to one of 2 paths. In the Morning hike, the leader gets to choose which path to take, while in the Evening hike the other player chooses first. In this version, it’s all about making things difficult on the other player without making it so bad that they completely mess you over in the second phase. The first player to reach the city wins. They also win if the other player’s explorers die off first. I have to say that I quite like the solo challenge. It’s a lot of fun and makes me think of the game Friday. I’m not as keen on the head to head version. I honestly prefer to play the game co-op. To me it just makes more sense and feels better thematically to me. I like working with other players to best survive the jungle as opposed to turning it into a game of take that. Overall I think fans of games like Friday or Robinson Crusoe should enjoy the co-op and solo versions of this game. Take that card game fans might enjoy the head to head challenge. For me, I really like solo and co-op. I love the stories that are made as I play the game. It’s one that I would definitely recommend. The Lost Expedition is a game of exploration and adventure that can be played in 3 different ways. The game isn’t very long. Most game sessions last around 30-45 minutes. The game looks great. The artwork on the cards is amazing. I like the comic book style designs. The tokens are a little bland but they work with the iconography of the cards. I also wish the cards had been linen finished to make them easier to shuffle. The rulebook is great and is very thorough on explaining how to play the game in 3 different ways. I really like the solo and co-op versions of the game. I feel the head to head feels a bit too much like a take that style card game and I’m not overly fond of it. The game provides a lot of adventure and fun packed in this box. Fans of adventure games like Friday or Robinson Crusoe should definitely enjoy this one. Take that fans might enjoy the head to head variant. Overall this is a great game that I would definitely recommend. Search and Rescue party not included. For more information about this and other great games, please check out Osprey Games at their site. This entry was posted in Reviews and tagged board, board games, card, card games, expedition, fawcett, games, lost, osprey, osprey games, peer, peer sylvester, perry, perry fawcett, sylvester, the lost expedition. Bookmark the permalink.